Yesterday Democratic Speaker of the House Paul Ryan and his Democrat-led House majority passed an Omnibus spending bill to fund the federal government for the rest of the fiscal year – from now to September 30, 2017. The bill passed with 310 voting YEA; 117 voting NAY; and 4​ not voting. The 310 votes for passage was made up of 178 Democrats and 132 alleged Republicans, meaning a majority of the votes needed to pass the Speaker’s bill came from Democrats. Democrats claimed victory over Republicans after passage of the bill, which excluded funding for the southern border wall and avoided $18 billion in domestic spending cuts sought by President Trump. According to Bloomberg’s Anna Edgerton and Erik Wasson, Democrats succeeded in eliminating 160 policy provisions they opposed, secured health benefits for retired miners and helped Puerto Rico fund its Medicaid program. Instead of placing stricter limits on legal immigration, the spending bill extends an investor visa program, expands a low-skilled workers’ visa program and would allow thousands more Afghan refugees. The bill, H.R. 244, has an additional $1.5 billion for border security, including 5,000 more immigration detention beds, though the bill actually specifies that money can’t be spent on a border wall. In short, everything candidate Donald Trump campaigned against, and everything that his voters expected him to protect them from, is in the budget and funded for the rest of the year. And in a sense they are, because yesterday’s vote shows their liberal policy goals and their Big Government, Big Spending ways are the defining precepts of Capitol Hill’s Democratic and Republican establishments, and hence the real bipartisan majority in Congress. 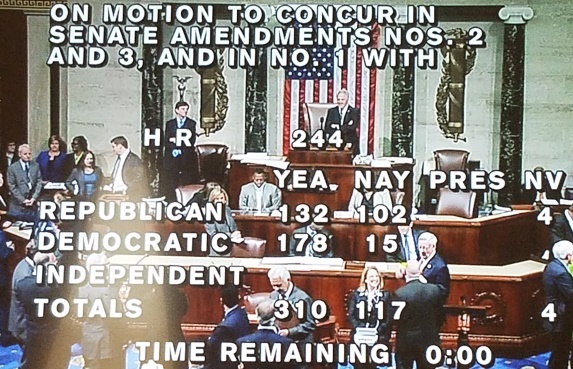 The good news is that this vote represents a significant increase in the conservative Republican vote that led the 2014 Boehner Omnibus to squeak through the House by only one vote. Back in 2014 only 67 Republican members stood against their Speaker and voted against the bill and, even with Obama and Biden calling them to rally support, only fifty-seven House Democrats voted for it. House Freedom Caucus chairman Mark Meadows of North Carolina said Wednesday that he voted against the omnibus spending bill due to "a lack of conservative priorities" in it and that the next spending measure should reflect Republican control of the White House, Senate and the House. "If we do not do things differently there will be a day of reckoning in about two years in November of 2018," Meadows said. Representative Meadows, one of the leading principled conservatives in the House is right, there is a reckoning coming in 2018, because, as far as we are concerned, the Republican congressional primaries start today. Submitted by email_registrat... on Sun, 05/07/2017 - 17:40. Submitted by email_registrat... on Sun, 05/07/2017 - 17:30. IMO the Nov 8 vote was a referendum of; the people vs the party. T was and is a candidate/president of the voters, the people. HRC was and is a candidate for the party, for the establishment. All democrats represent the party to the people. As do RINOs. The establishment is so entrenched they are America's royalty. The reason the establishment pols vote the way they do is because of self serving ideas. They think they will get elected or reelected or at least get support in the media and plenty of campaign funds. We are in the early stage of the second American revolution. T made a new declaration of independence by declaring he was free from party ownership. T is an American president, not a party president. IMO it is not possible for a democrat to be an American president. There needs to be massive unintended consequences for all party political hacks for many elections in the future. Submitted by 1American1st on Thu, 05/04/2017 - 13:15. Meadows is correct. The PRIMARIES will be the "Day of Reckoning". If the Swamp Rats don't get behind OUR PRESIDENT then we will find bigger gators with bigger balls to drain the Swamp. It's NOT about THEM & filling their pockets with our hard earned tax dollars. It's about politicians becoming responsible representatives for the people for a change! Submitted by email_registrat... on Thu, 05/04/2017 - 12:56. The Agitation and Propaganda organization of the Democrat (Marxist) Party consists of our Main Stream Media: ABC, NBC, CBS, MSNBC, New York Times, Washington Post, Los Angeles Times, Chicago Tribune, Boston Herald, and literally hundreds of local newspapers, television and radio stations; then we have Google, Facebook, and Twitter in the hands of our “progressives”; on the other side there is only Fox (sometimes) and American Spectator, National Review (also sometimes).